Decorative columns hail from three distinct porches. Once inside, the airy layout creates space and light. The built-in bookcase in the great room and bay window in the breakfast area are special amenities designed to expand living- just like the master suite. Note the detached garage connected by the porch. Other Storage: 305 Sq. 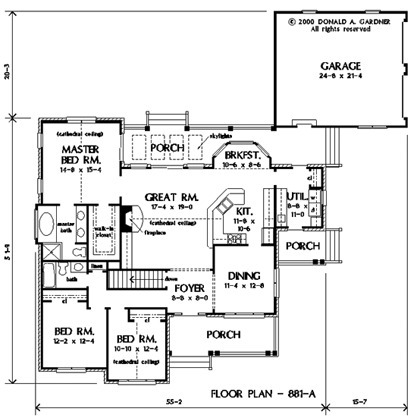 Ft.
House Dimensions: 55' 2" x 50' 5"
Bedroom #3 : 12' 2" x 12' 4" x 9' 0"
Porch - Front : 21' 2" x 8' 0" x 0' 0"
Porch - Rear : 38' 10" x 8' 0" x 0' 0"
Porch - Right : 9' 0" x 7' 0" x 0' 0"
Storage (1st Fl.) 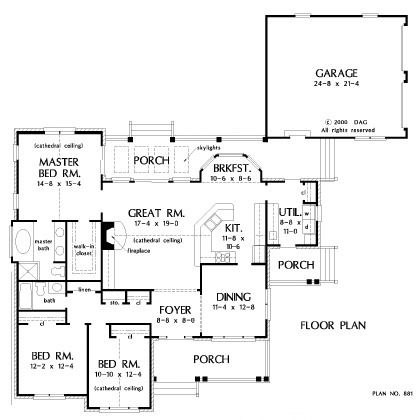 : 4' 0" x 2' 0" x 0' 0"
Foyer : 8' 8" x 8' 0" x 10' 0"
Dining Room : 11' 4" x 12' 8" x 10' 0"
Great Room (Cathedral): 17' 4" x 19' 0" x 16' 0"
Kitchen (Cathedral): 11' 8" x 10' 6" x 16' 0"
Breakfast Room : 10' 6" x 8' 6" x 9' 0"
Utility Room : 8' 8" x 11' 0" x 9' 0"
Garage : 24' 8" x 21' 4" x 0' 0"
Master Bedroom (Cathedral): 14' 8" x 15' 4" x 16' 8"
Bedroom #2 (Cathedral): 10' 10" x 12' 4" x 14' 10"